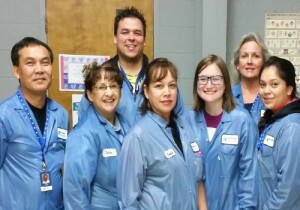 Late last year, the stockroom team at our Portland, Oregon electronics assembly facility participated in an impressive kaizen “continuous improvement” event. Their four main objectives were; develop a new stockroom layout, optimize process efficiencies, expand material storage, and implement a 6S program. This program is based on the Japanese 5S (Five Pillars) system – which, when implemented, helps to provide the strong foundation of a holistic Lean system. A 6S system adds the concept of safety to the first five pillars. Therefore, the team decided that the PCB assembly stockroom area undergoing the improvements would be included in a safety audit, as part of the implementation. In the case of the stockroom, the team identified several improvement opportunities for altering the shape and flow of stocking locations, which has helped to facilitate more efficient kit pulling. Inspection, count and audit tables were moved, a color-coded overstock area was created, and shelf layout was redesigned to help minimize both non-value added traffic flow, and material transport time. After measuring the service cycle times and deciding to set new standards, the team also introduced two new options for how production personnel can request parts from the stockroom when they need to do so. If they have an immediate need, they can flip on a “hot part” light – and a stockroom team member will quickly assist them, or they can utilize a new “inbox” system to fill standard part requests. An average decrease of 80 percent of identified safety issues between pre- and post-event scores. “The new changes made by the team have helped to reduce time spent looking for parts, and also creates a way for other personnel to quickly find what they need from the stockroom, without interrupting the kitting process. The system has also been made much easier to understand, which allows new employees to quickly learn and perform their functions almost as efficiently as those who have been here a long time. We work within high mix, low volume electronics assembly production schedules – with many ongoing variations in demand. This creates some challenges for maintaining adequate flexibility in our processes. 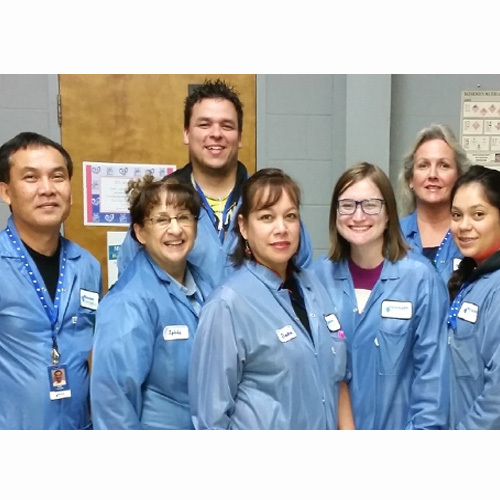 For our fast-paced electronics manufacturing environment, improvement efforts like this one aim to create optimum levels of organization and process control in the stockroom. This increases our ability to rapidly and cost effectively support the variations in demand which an electronics contract manufacturer such as Milwaukee Electronics must navigate,” said Ashley Rochholz, Continuous Improvements Manager.